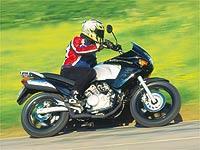 Like its bigger brother, this Varadero uses a V-twin, but it has a learner-friendly 125cc capacity. That’s not really enough to cope with gusting headwinds, reducing your rpm to 10,000 instead of 12,000 and just 60mph on the clock. When a hill was added into the mix, it began shedding revs and speed faster than a wannabe model ditching her clothes for Page Three. But that’s learner-restricted 125s for you. It’s not a bike likely to see much off-road action – which is actually a good thing. You might expect a V-twin 125 to pick-up like lightning, but the Varadero has a docility about it that means spinning a rear wheel – even on loose gravel – is out of its league unless you get your weight firmly forward. The suspension is an odd combination. It feels softly-sprung, but over-damped, giving a ride that’s fine on smooth roads, but becomes jarring when the going gets bumpy. That’s a pity, as the nature of the engine keeps you away from open A-roads and sends you on to twisty back lanes where you can just wind it up and feel like you’re making good progress. But those roads tend to have the worst surfaces, making the ride more important. You’ll just have to put up with the bone-shaking journey, though, as only the rear pre-load can be adjusted. The best thing, however, is that you can easily roll through those gravel patches you often find where farm tracks join country lanes. The bizarre Bridgestone TrailWing tyres may also be responsible for that. They look like full racing wets and are soft when you use the old thumbnail test, though even on a hot day they didn’t get too warm. Still, that didn’t seem to affect grip too much. Around the lanes, they let the bike steer quickly, making it drop into turns in a way that encourages you to stick a foot out supermoto-style. The tip-in is pretty quick, though, so for learner riders this bike could be a little disconcerting at first. Still, the bike looks like a proper bike. It’s big enough to give you some real street presence and comfort is pretty good, too.